Our mission is to disseminate knowledge that informs practice in the field of education. 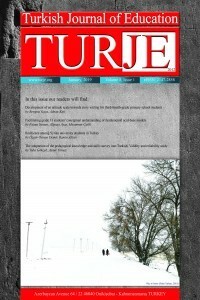 TURJE ,as a refereed journal, offers four themed issues each calendar year that include research articles, explications of theory, reflections, and essay reviews of academic/professional books. Every article describes implications for practice beyond the setting in which the work was conducted. The journal helps researchers and professionals communicate novel ideas, applications and developments in education in order to maintain their competitive edge. This scientific journal is published under the guidance of an expert international board and presents fully refereed papers on practice and progress in the field. The journal reaches a global audience of academics and researchers in the field of education and surveying disciplines, educational leaders, teacher trainers, teachers, and students. Turkish Journal of Education publishes regular papers on topics of interest to international audiences of educational researchers. Regular issues have an open call for manuscripts. Turkish Journal of Education, an internationally peer-reviewed journal, is published four times a year in January, April, July, and September. All the serial issues have been published in English in Turkish Journal of Education. The manuscripts submitted to the journal should have a plain and clear language quality and should be consistent with the scientific literature and language rules. Manuscripts should be written in a fluent language which is free of foreign words.